A clutch is located between the engine and a standard transmission and is designed to disengage and then engage the engine from the transmission so you can shift gears. The clutch consists of a pressure plate, throughout bearing, clutch disc, clutch master and salve cylinders or a clutch cable and finally a clutch pedal and a pilot bearing which is usually included in rear wheel drive cars. 1. Clutch Pedal: A clutch pedal is located to the left of the brake pedal and is used to operate the clutch. 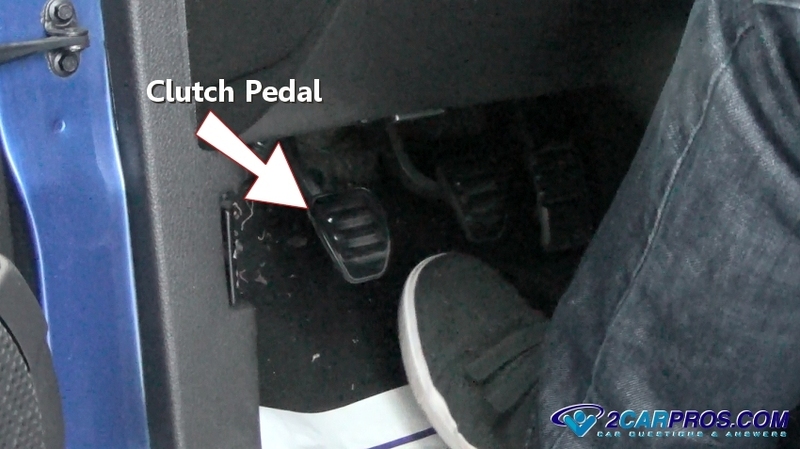 Pushing the pedal downward disengages the clutch and allows the car to freewheel from the engine. While slowly letting the pedal upward the clutch will start to engage the engine to the transmission and transfer power to the differential and then onto the drive wheels of the car. 2. Clutch Master Cylinder: The clutch pedal is connected to a clutch master cylinder which produces hydraulic pressure when the pedal is pushed downward. Much like a brake master cylinder it uses brake fluid to operate and will have a fluid reservoir under the hood of the car. A small hydraulic line runs from the clutch master to the slave cylinder. 3. 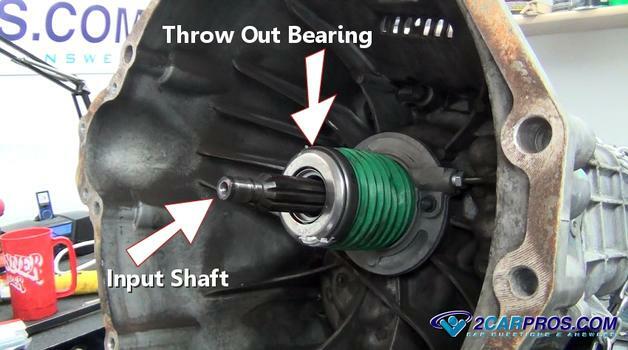 Clutch Slave Cylinder and throwout Bearing: The slave cylinder can be located in two different places near the front bell housing of the transmission. One location is bolted to the outside of the bell housing which is then connected to a clutch fork positioned on a pivot which then pushes the throwout bearing into the pressure plate. The second location is directly inside the bell housing attached to the throwout bearing with the input shaft of the transmission going though the middle of it. This bearing is used to ride against the pressure plate fingers and actuate the clutch. 4. 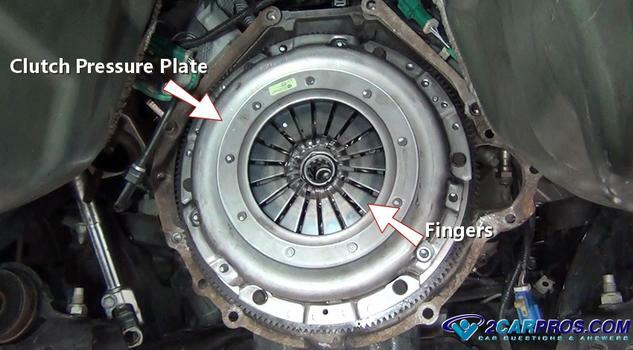 Clutch Pressure Plate: The pressure plate is bolted to the flywheel which is then bolted to the engine crankshaft. This plate then holds pressure against the clutch disc and the flywheel which transfers the engine power to the transmission's input shaft. When the slave cylinder is actuated it moves the throwout bearing against the pressure plate fingers and then pushes them inward. 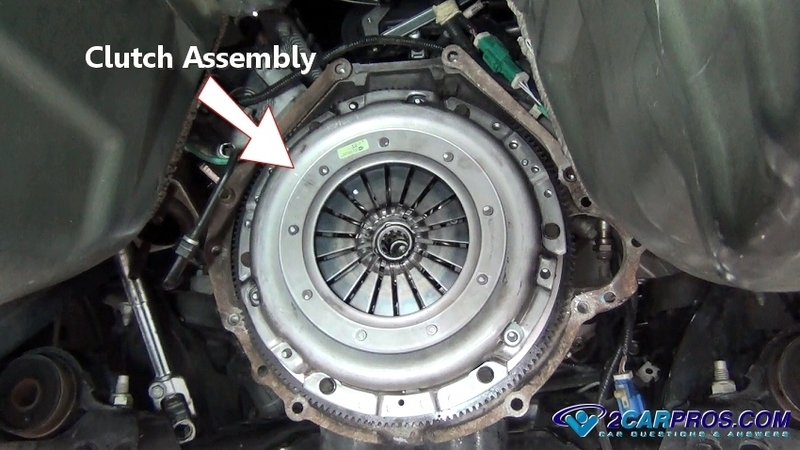 This motion is what releases the clutch disc from the pressure between the pressure plate and the flywheel. 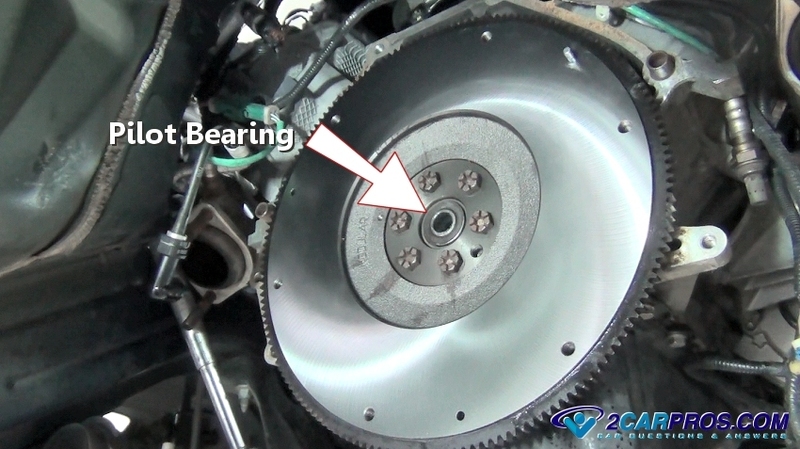 The picture below show how the bearing rides against the pressure plate when the transmission is installed. 5. 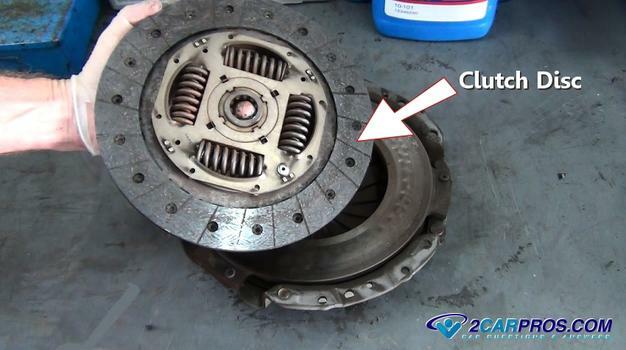 Clutch Disc: A clutch disc is fitted between the flywheel and the pressure plate is lined with asbestos much like a brake pad. This lining is what eventually wears out on the clutch and starts to slip. 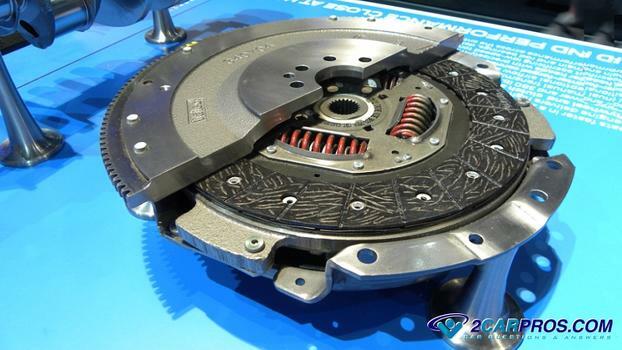 This disc slides over the input shaft of the transmission which has a spline. When a vehicle is stopped and in gear with the engine running, and with the clutch pedal depressed the flywheel and pressure plate rotate at engine speed while the clutch disc is stopped allowing you to shift gears without grinding. The clutch disc and pressure plate are removed in the image below. Here is the flywheel bolted to the engine crankshaft. It also features the pilot bearing that is inserted to the rear of the crankshaft. This bearing supports the opposite end of the transmission input shaft. This is a picture of a cutaway flywheel so you can see what the clutch assembly looks like all together.